Yeah, how AWESOME is this! A new internet buddy, Alysabeth Johnson from Layin’ Rubber Ink gave me this nifty award. I am so grateful. I work so hard to make this blog fun, informative and entertaining; it is so nice to be recognized once in a while. There are more I wanted to honour, don’t worry, your turn will be next! Awww Rebecca, you are such a sweetie! 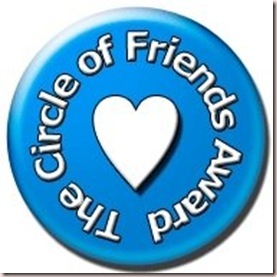 I love my blog friends and I'm glad you are one of them!